The term cognitive bias defines an error in decision making or reasoning. This means disregarding an accurate, as well as, objective information in favor of subjective preferences and believes. In other words, people exhibit cognitive behavior when they go with their gut feeling, and overlook the objective information that is essential for the smart decision-making process. Adding to this, such persistent irrational behavior or bad choices can lead you to bankruptcy. Let’s have a look at the examples of cognitive bias. Sunk cost fallacy means that your decisions are tainted by the emotional attitude. The more you feed your mind for emotional decision making, the harder it becomes to abandon it. To avoid bankruptcy situations, one needs to make a rational decision with emotional intelligence. Therefore, the frequent cognitive bias which is usually visible in bankruptcy practice is the Sunk Cost Fallacy. In which the client normally refused to surrender an expensive house or car because they have put a hefty amount into that asset. Also, surrendering that asset means throwing away their money. Obviously, in crippled financial times, the sane mind says, that, you need to re-evaluate your situation and analyze what you can comfortably afford and what you cannot. Further, if you are considering bankruptcy then you need to fight against the sunk cost fallacy. There is a famous saying, that: “don’t throw your good money after bad”, which is a right approach if you are struggling with a sunk cost decision. Yet another example of cognitive bias is called “Framing Effect”. In which people responded to multiple choice in different ways depending upon how it is presented, either as a gain or as a loss. A case in point is when a salesperson utilizes selective facts to tempt their customer to make a purchase, which they really don’t need. Some slick salesman used the framing effect to convince their potential customers that they will save tens of thousands of dollars on their vacation by buying a timeshare in Orlando in comparison to the cost of staying in a hotel for a unique vacation, every year. After making the said purchase they are bombarded with multiple maintenance fees, which eat up their savings. Families who are victims of this framing effect still stuck with multiple timeshares. Besides this, some aggressive salespersons force a customer to make purchases on things they don’t need them such as carpet shampooing system, solar panel installations or water purification systems. In a nutshell, there are many more cognitive biases, identified by the experienced psychologists, which can lead you towards bankruptcy but you get the picture. There is no doubt that anyone can fall prey to lapses in judgment, though we need rationalization in the greater interest of ourselves. But, if you are unable to pay for your basic necessities like clothing, food, and shelter because the disposable income is allocated for the payment of housing and transportation. Then, in such a scenario, payment of non-necessities like timeshare or water purification system is not a good idea, and need of a bankruptcy lawyer is a must. A Detroit bankruptcy lawyer can save your financial condition by taking you out of the bad deal as well as poor decision making. Last but not least, it can help you in regaining your peace of mind. 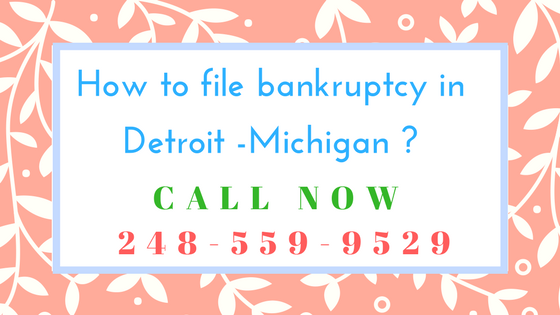 How to file bankruptcy in Detroit – Michigan ? A state of diverse economy and majorly known as the center of the U.S. automotive industry, there is no wonder that the state witness a huge monetary transactions and a number of legal issues germinating from these exchanges. We mainly focus on the issue of bankruptcy in our following article. While in general, the filing process for bankruptcy is similar to that of other U.S. states. There are a few Michigan-specific information to be kept in mind depending on the Michigan Law. As a resident of Michigan, where should I file for Bankruptcy in particular? This entirely depends on which part of Michigan are you from. Michigan is divided federal judicial districts-Eastern and Western district the bankruptcy courts are similarly divided and the main courts for east and west districts are in Detroit and Grand Rapids respectively. You can file for Bankruptcy either from the district where you have lived for more than 180 days before filing bankruptcy or where you maintain a permanent residence though you have been living away temporarily. What is the state median for Michigan and am I eligible for filing Bankruptcy under Chapter 7 Bankruptcy in Michigan ? As on 2015, Michigan state median for an average family of four was $63,893 annually. In case your average income for six months before filing for bankruptcy is less than this median you are eligible for filing bankruptcy. In case this is not so, you have to go through a string of tests to be considered as eligible for chapter 7 bankruptcy. Are there any special exemptions under Michigan Bankruptcy Laws? Michigan bankruptcy Laws allows the debtor more flexibility to be able to protect a larger part of their properties and they can choose between state and federal exemptions. Exemption up to $$56,650 is allowed for those over 65 years age or differently able. Other than that homeowners and their dependants are exempted up to $37,775 of their interests on housing or similar properties. For more info on homestead exemption . Which form should I fill up for filing Bankruptcy in Michigan? Besides bankruptcy petition, the debtor has to go through a complex calculation called the “means test” for chapter 7 and similar test for chapter 13 bankruptcies as well. Forms 22A and 22C or Statement of current monthly income and Means Calculation Test (for chapter 7 bankruptcy) and statement of Current Monthly Income and Calculation of Commitment Period And disposable Income (For chapter 13 bankruptcy) namely should be filled up according to the bankruptcy chapter under which you choose to file. These forms provide the debtor a list of expenditure that includes rent, food, and childcare. These comprise of the Standard deduction figures in Michigan. It can be concluded that while there are differences in the federal laws all over US, they are not altogether vastly different or complex. A little prior research before filing for bankruptcy can help a lot with your future decisions. Are you going through financial stress ? Leave your stress on us (Bankruptcy attorney in Detroit) . Should I Stop Paying my Credit Card Bills before Filing Bankruptcy ? Once you make up your mind about filing for bankruptcy you must sort out the bills and debts that you intend to clear through bankruptcy and those which has to be paid anyways or the non-dischargeable bills. Credit card bills are dischargeable and are the most popular types of debt to be sorted out through filing for bankruptcy all over Michigan. But when do you stop paying your credit card bills and consider filing bankruptcy ? Or what amount of credit card bill can actually be considered large enough and beyond your capacity to pay off ? Factors like whether if you can pay off your debt, or harassment you are facing from creditors or the amount of non-exempt property you own all together exert a vital influence on your decision for filing bankruptcy. Is my credit card bill large enough to be considered for filing bankruptcy ? While you deliberate upon the decision of filing bankruptcy the first thing to be considered is whether you can afford to pay your credit card bill. If you have enough money to do so you may not be eligible for filing bankruptcy. I am eligible for filing bankruptcy. Do I still need to keep paying my credit card bills? Once you qualify as eligible for filing for bankruptcy, even before you file the petition with the federal court, you can stop paying your credit card bills as that would be nothing but wastage of money since these are the very debts you are going to wipe out through bankruptcy. Is there any chance that I would be sued or harassed by the credit card company once I stop paying ? If your last credit card bill is within 90 days from the day of filing for bankruptcy and was spent on luxury goods, the credit card company can sue you in that case. This situation would be posed as fraud on the grounds that you deliberately made these purchases without any intentions of paying back at all. We strongly advice for delaying the filing for bankruptcy if this is the situation. Apart from this, credit card companies cannot legally harass you for payment as the “automatic stay” gets active once you file your petition with the federal court that prevents creditor from extracting money legally from you. However for the time being before filing for bankruptcy, it is likely that you get frequent calls from debt collecting agencies asking for payments. It is best to ignore these calls till you file for bankruptcy. I am not sure if I will end up filing for bankruptcy, should I stop paying my bills anyways ? If you have decided firmly about filing for bankruptcy, stopping your payments to the credit card company is fine but if you are not so sure would advise against non-payment. The longer you will leave out your payments the more likely you are to fall prey to lawsuits and harassment and probable damages to your credit records. Not paying your credit card bills once you are absolutely decided on filing bankruptcy is a feasible idea but one should always be careful about any loopholes in your financial situation that may go against you. Let an Experienced Detroit bankruptcy attorney only to evaluate your financial conditions before stopping payments. Is bankruptcy the best option for me to handle debt? Is bankruptcy going to be the best option for me ? One, of the most common cases to be filed in US, bankruptcy is the last resort for debtors who are facing an extreme situation of debt. Yet often the suitability of filing bankruptcy under certain situation is questioned and many debtors try and avoid filing bankruptcy as long as possible. What choices does one have in Michigan for managing debts apart from bankruptcy filing? Bankruptcy filing is the last resort in extreme situation. One can also go for debt settlement, reaffirmation plans and negotiate with the creditors and lastly debt consolidation. Each of these choices will require good negotiating skills and you have to pay off whole or a part of the debt you have incurred. Managing the money for paying off is the most crucial part. While you can pay off the amount over a certain span of time, the amount of debt that you are paying is an important factor to be taken into account. 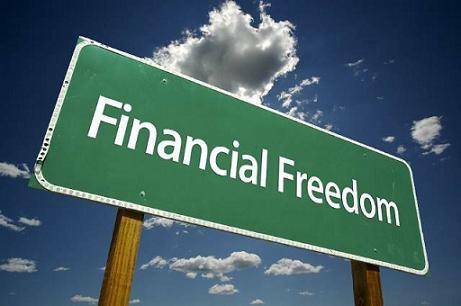 How can I understand whether bankruptcy is the best option or not for me? There are a lot of factors that should be considered in deciding whether bankruptcy is the best option for you. The amount of your debt is a major factor to be considered. If it is too huge to be paid through any of the choices mentioned above then bankruptcy should be considered and is the only choice that is left to you. The type of debt that you have incurred is also another that decide whether bankruptcy is your best choice. While credit card debts and similar one can be wiped out through bankruptcy, student loans, and child support cannot so choose accordingly. The last thing that you should consider is whether you are ready for taking a step as crucial as bankruptcy filing as there is no turning back once the procedure begins. While you can make a basic judgment of your situation, a bankruptcy lawyer who has been in the bankruptcy business for long can analyze your situation far more critically and minutely. Every case of debt is different from one another and hence requires handling in the right way and a professional can do exactly that and provide you the necessary advice. 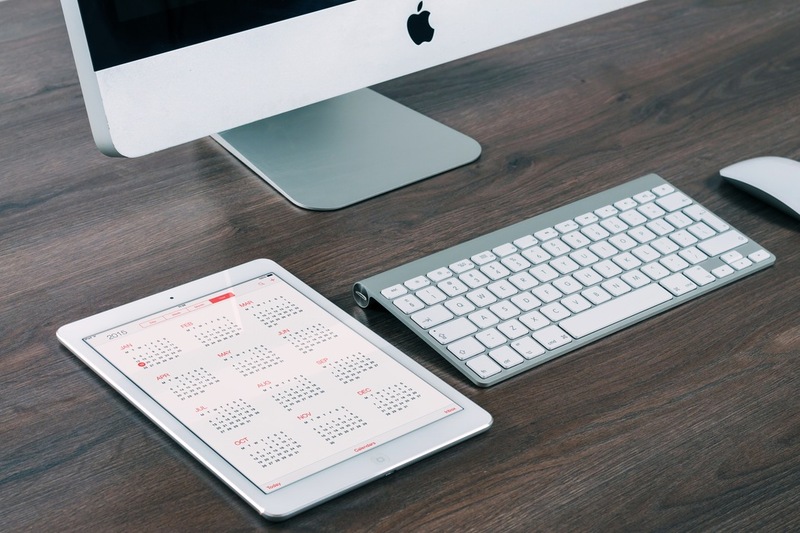 Filing bankruptcy within a certain period of time is ideally the most advantageous choice that you can make, so while pondering and considering every available option is necessary, be sure not to take up too much time and miss out on the best time for filing your case. Your bankruptcy attorney can decide when filing bankruptcy would be the best for you. At A Better way Bankruptcy (Affordable Detroit Bankruptcy Attorney) , we strongly advise our clients to get an appointment for a consultation early even if you are not very interested with bankruptcy. This way while providing you sound advice we can also let you know the best time for filing bankruptcy if you finally resort to it. So book your consultation with us at the toll free number 844-372-7324. Find a Local bankruptcy Attorney at Michigan ? When you are deciding on filing for bankruptcy, your decision can be majorly influenced by your attorney. So finding the perfect, experienced and at the same time sensitive bankruptcy attorney is important for the welfare of your case. In the following article we will try to provide you guidance while searching for the perfect attorney for your case. Each case is unique in its own way and deserves customized attention which is at once good and cost effective. We also understand that finding an affordable bankruptcy attorney is one of the major concerns of debtors in Michigan. A detailed overview of the traits that you should look for in your attorney along with the nearest areas in Michigan from where you can avail the services will be provided in the article that follows. What are the factors that you should keep in mind while hiring bankruptcy attorney in Michigan ? · Bear in mind that, more experienced the lawyer; the more likely he or she is to be able to grasp your problem and give you the necessary suggestions. So when you are deciding on the attorney, check his experience in the field he is working. · Also go through the records of how well he fared in the recent cases that he handled. · But above all, talk with him or her couple of times before finalizing and see if you are comfortable negotiating with the attorney. The understanding between the client and the bankruptcy attorney is highly important for the sake of the case. · If your attorney succeeds in making you feel calm and at ease and seems to be sensitive about your sentiments yet firm and practical with his suggestions, then he is the ideal person for handling your bankruptcy filing. · The expense is another very important point to be kept in mind. You can find cheap bankruptcy attorney in Michigan who may charge a very modest amount for their services but the no less capable than the expensive lawyers whom you cannot afford. The expense is crucial as once you are decided on going bankrupt, every little pence matter. Our Lead attorney, Lyle Lieberman who particularly specializes with chapter 7 and chapter 13 bankruptcy and has gained numerous experiences over a period of 25 years is always too happy to assist you with any issues that you may have. At A Better Way Bankruptcy, we particularly pay attention to the sentiments of the clients and do understand that going through bankruptcy is particularly hard and even traumatizing. Our professional and warm staffs are very considerate of these details and we aim for complete client satisfaction for a decently affordable fee in every way. Moreover, our initial consultation is free of cost for which you can get an appointment through the TOLL FREE phone number at 1-844-ERASE-BILLS. Where can I find a Local bankruptcy attorney ? The law often differs ever-so-slightly from one place to another hence it is essential that you choose a lawyer who is specifically thorough with the bankruptcy laws of your respective areas. So depending on your specific are you can search for a bankruptcy attorney online or through a friend or in your immediate neighborhood. If you are from or near around Ann Arbor, Auburn Hills, Detroit, Royal Oak, Southfield, Sterling Heights, or Warren, you can reach out for our service. We intend to expand your services beyond the specified areas in future and gain inspiration from the faith that our clients show in us. So do not feel down if we are entangled in debts and look for your nearest affordable bankruptcy attorney today. What Can you do to Save your house in Bankruptcy ? How do I Save my Home in Bankruptcy ? Our home is our most important asset of all that we own. It represents everything from our personal taste to our financial and economical position as well as is deeply entwined with our sentiments and emotions. So by all means, securing our home is always a priority for us. When you are considering filing for bankruptcy, the security of your home is one of the vital doubts that are bound to come in your mind. Losing your house in any ways- be it through foreclosure or selling it to pay your creditors through a trustee, is not desirable. So what can you do to save your house? Do keep in mind that while you may be able to keep your house in some way or the other, whether you can maintain it in the long run is actually the factor to be considered. Can I keep my house if I file for Chapter 7 Bankruptcy ? If your house’s equity is exempt and you can afford the necessary payments then you can keep your house. However if there is some amount of non exempt equity in your home, keep chapter 13 bankruptcy in consideration as well. It is less than likely that you have some nonexempt equity on your house and the trustee is not going to attempt to sell off your house to pay the creditors. The automatic stay will give you temporary relief from the lenders as they will be prevented from carrying on with the foreclosure proceedings under the court’s order of the automatic stay. 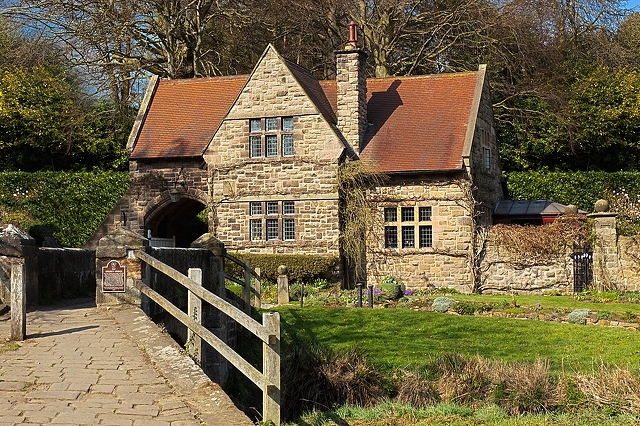 The lender can appeal to the court for removal of the automatic stay and the court may accept that in case you are behind your payments which will eventually lead to losing your home. Chapter 13 or Repayment plan bankruptcy is designed so that you can repay a portion of your debt through a plan of three to five years. This way you do not need to sell any of your property to afford the payment and hence keep your home. Consider contacting your lender and discuss on entering into a reaffirmation agreement for your home. Reaffirmation agreement is like a contract between the lender and debtor by virtue of which the debtor can keep his or her home in lieu of regular payments of mortgage related loans in the future. If you are indebted to the verge of losing your house, it is high time to put a check on your financial issues. If you cannot afford to maintain your house, however difficult the decision may sound, you should actually consider selling it. The house is an asset that has a lot of attachments with our life and losing it will definitely bring a huge change in one’s life. Contact your lawyers for the best advices on this issue in further details. How to Manage your Shopping so as to Avoid Debt? Michigan can prove to be a shopaholic’s temptation when we take into consideration the number of malls where the price range varies from cheap to mid-range to expensive and where one can always find tempting bargains offered throughout the year. Be it TJ Maxx or Marshalls, it is a tough fix for the incurable shopaholic when you see the bargains alluring you from every side. But these very temptations in the form of discounts and combos can become the major factors for pushing you towards debts. While indulgence is healthy from time to time, one should remember to exercise some control over their expenditures. Every year, a major number of the total filed bankruptcy cases dealt by federal courts all over Michigan are resultant of debts incurred from reckless spending through credit cards. Plan ahead : Chalk out the average grocery and other bare essential required by your family each week. Know the market values and draw up the budget accordingly for weekly expenses. Follow a List : Before you go to the supermarket, make a list of the items which are absolute necessities and not outcomes of your whims. It goes without saying that just making the list is not enough; you should follow it as well. Stay Updated : Keep check on the latest discounts and offers in the markets. Compare them so as to choose the most economic offers among them. Often these discounts are not as cheap as they are publicized to be and so it is better to survey the market well before indulging. Compromise : Think about compromising with your brand. If you currently shop for premium quality brands only consider trying out the cheaper ones to fit a budget. Cheaper brands are bound to be cheaper in quality- try and get out of this mindset. If you cannot differentiate the qualities of the regular and premium brands, then why pay more for the premium one? 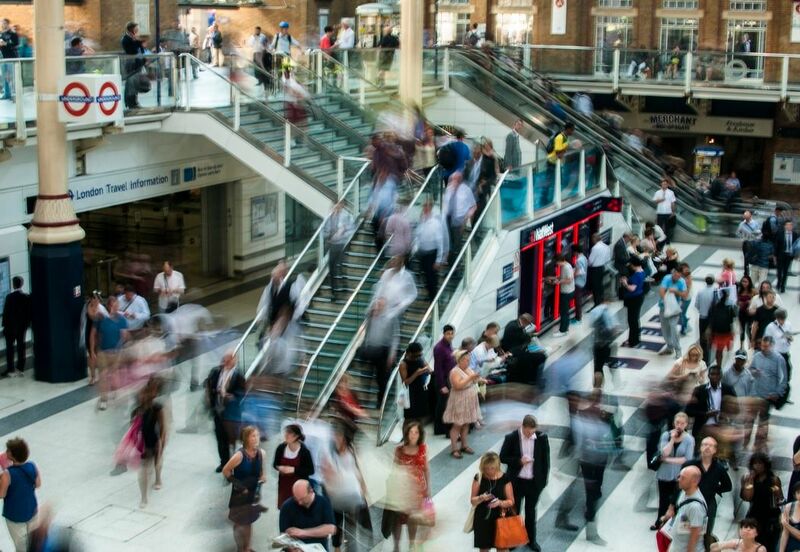 Take your time: Go for shopping when you have ample time to spare. Comparing and contrasting for making the better deal can be more time consuming and confusing than you can imagine. Rushing through your shopping will only result in over-spending. You will grab the first things that catch your eyes without pausing to check for cheaper alternatives. Smart Phone : Today everybody owns a smartphone and it comes extremely handy while shopping when doubled as a calculator. You can keep track of your expense on the go as you shop and also calculate the discounted values when and if necessary using the calculator of your phone itself. Ignore temptations : Lastly, don’t get tempted by catchy ads of discounts and forget your budget. These temptations are the main culprit in draining excess credits. Walmarts, Boots, Tesco, Morrison’s are some of the most popular supermarkets where you can find everything you need within a budget. A disciplined and planned life is the best way to avoid falling victim to debts. Bankruptcy and Divorce- Are they interrelated ? How it works ? Bankruptcy or Divorce Which Comes First ? Apart from bankruptcy, another major personal legal undertaking by many in Michigan is perhaps divorce. Though the number of divorce has gone down since 2005 this does not necessarily ensure the decline in the rate of divorce which varies with respect to the population fluctuation. Often, it is observed by those in the legal profession that an individual tend to file bankruptcy and divorce consecutively or parallely even sighting bankruptcy as an outcome of divorce and often vice versa. But how far are these two distinctly different legal procedures interrelated, if at all related? 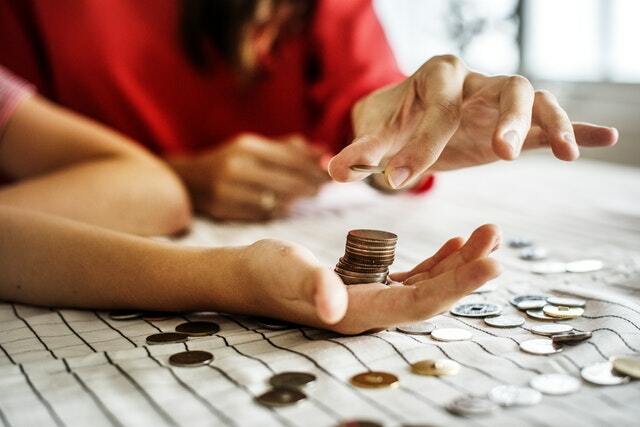 Both divorce and bankruptcy are expensive legal undertakings but if chosen wisely, one can complete both the legal filings quickly and in a cost-effective way. Can we file Bankruptcy and Divorce Simultaneously ? Filing Bankruptcy often involves distribution of assets to creditors which is a complex procedure and may cause disputes in case of joint properties. So It is best advised to complete the bankruptcy filing before continuing with divorce. Depending on your marital status, the federal court treats your income and savings accordingly which may also get hampered if you try to parallel tackle both the issues. Filing for divorce simultaneously can delay your bankruptcy discharge which in turn may result in further harassment. Chapter 7 or Chapter 13- which one should I file for ? Chapter 7 or liquidation bankruptcy wipes out your dischargeable debts through distribution of non-exempt properties that you own and the case is closed within a few months. Hence the whole bankruptcy procedure gets over fairly quickly and you can file for divorce after that. However chapter 13 or repayment plan bankruptcy is a slow procedure where you fully or partially pay off your debts over a span of 3-5 years. If you are in a hurry to divorce, this is definitely not a good plan to go ahead with. But then you may want to retain your property as well. So the decision entirely depends on your priorities. We understands such situations and we handle clients with such sensitive crisis delicately and try our best to advice you on what will be of your benefit. 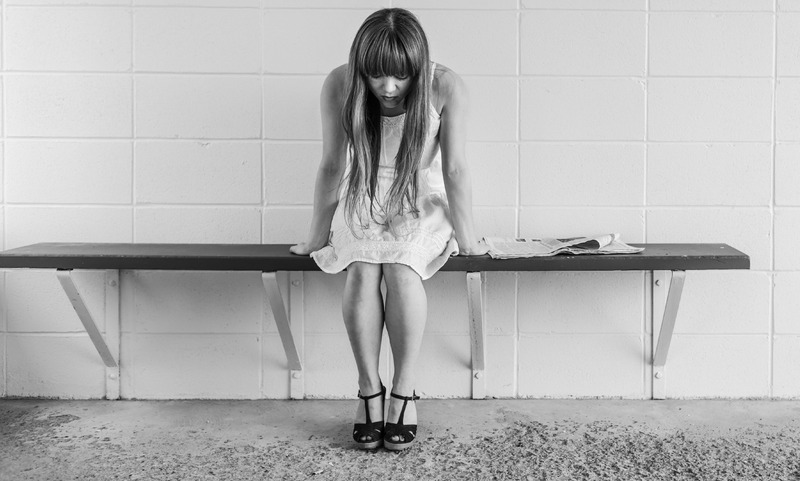 What if I file for bankruptcy after divorce? In case you file for bankruptcy as a single after divorce, the creditors cannot sue you for payments of debts due to the automatic stay. But it is not unheard of that creditors harass your ex-spouse for the same debt since it was signed for together. In this situation if the ex-spouse is forced to pay these debts he or she can again sue you at divorce court for compensating the amount and you end up paying the debts anyways. Both divorce and bankruptcy are complicated and it can rightly be said that handling both together is like biting off more than you can possibly chew. Both have its own advantages when filed before the other. One should recognize his or her priorities though before making any concrete decision. It is likely you will be completely overwhelmed by the stress and a complexity of both the issues and this is where your lawyer steps in. We always advice filing bankruptcy over divorce as the later can always be reconsidered and reconciled till the very end unlike a situation calling for bankruptcy filing which rarely have other ways out. Should you want to seek further detailed and personalized advice, our compassionate and friendly professionals at A Better Way Bankruptcy would be happy to help you. 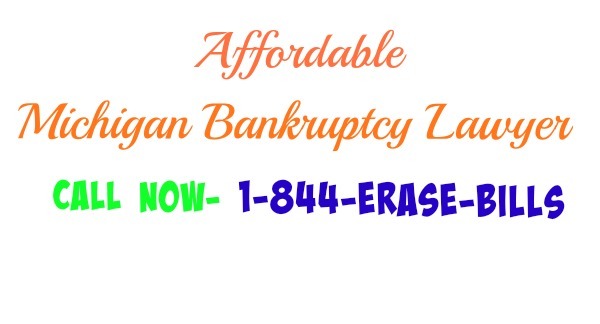 Book your FREE appointment with us today through our website www.abetterwaybankruptcy.com or our Toll FREE number 1-844-ERASE-BILLS. Filing for Bankruptcy online – Is it possible ? How to file Bankruptcy Online ? Keeping pace with the ever-evolving technology, today almost everything we can think of doing is possible online. Hardly a handful few still prefer the usual conventional ways of life over the virtual comfort. When the services are available within the comfort of one’s home it would be an unnecessary trouble to seek the same service manually. Today, even legal aid is made available online, as law firms all over Michigan reach out to their clients through websites, blogs etc. Bankruptcy, which is the most common type of case filed all over US, is now also possible to be filed online. In this section, we will discuss the necessary basic knowledge to be aware of before filing for bankruptcy online and clear any query that you may have regarding the aid that our clients receive from our office regarding the same. Is it necessary to seek professional advice while filing for bankruptcy online ? If you are thoroughly at par with the legal requirements and the paper-works following the petition and procedures of filing for bankruptcy, you may feel confident enough to file without professional help but it is strongly advised to seek help of a specialized bankruptcy attorney. The whole procedure starting right from the time of filing petition to the bankruptcy discharge is thoroughly complex and often consists of intricate details that only an experienced professional can recognize. Public Access to Courts Electronic Records system or PACER system allows individuals and businesses to file for bankruptcy through relevant courts online since 2001. One can register through them and proceed accordingly. But consulting a bankruptcy attorney is strongly recommended to get expert opinions as every case is unique in its own way and only a professional can understand the exact requirements of your case. At A Better Way Bankruptcy, provide a free consultancy to anyone based in Michigan particularly all over Detroit and the suburbs, so you can actually access your present situation. You can seek appointment for FREE Consultation on phone through our Toll Free number 1-844-ERASE-BILLS or by registering with our site for your free consultation. Filing for bankruptcy online or the conventional way- which is preferable ? While the concept of filing and completing the whole procedure online is tempting in many ways there is really no substitute for meeting your attorney in person and seeking the answers to your doubts from an expert first-hand. Online filing has gained popularity on the grounds of privacy and economical convenience as one can skip the fees of the attorney. But the basic question is evaluating one’s situation to understand whether you are at all eligible for filing for bankruptcy. Our free bankruptcy evaluation option is always at your aid. Our clients are always advised by us to seek expert guidance even if they are choosing to file for bankruptcy online. We are always at your service, now seven days a week. Bankruptcy is a complex legal procedure and will be best handled by a professional experienced in this field. Our Attorney at A Better Way Bankruptcy, Lyle Lieberman, with his excellent expertise gained over 24 years of practice and specializing in Bankruptcy filed under Chapter 7 and 13, is always happy to help anyone who seeks for it.